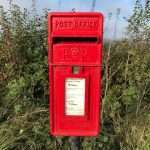 Postbox values – For the fainthearted . . . In memory there was a brick pillar box at the road junction. The main road formed the top stroke of the “T”, the pillar box stood opposite the point where the side road connected with the main road. 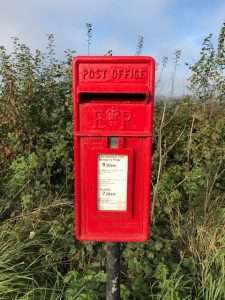 In the story remembered, someone had driven up the side road at excess speed, and, being unable to stop, had crossed the main road, collided with the pillar box, and had died as a result of their injuries. It was all a long time ago, and it might have been at a road junction very far away. The problem of a childhood lived in pre-internet days is that one cannot instantly verify or falsify every story recalled. Perhaps, if the accident had been at the road junction remembered, it might be possible to check its veracity in the archives of the local newspaper, though if the editions covering the years concerned have not been digitised, the search might be lengthy. The location remembered is at the point where a road from the hamlet of Upton joins the road from Langport to Somerton in Somerset. The story recalled or imagined, as the case may be, was of a local driver careering across the road and demolishing the brick pillar that contained the red postbox. Whatever the location, it was the report of the story that became significant in the thoughts of a small boy. Of course, it was silliness to confuse a public and avoidable fatality with the private and unavoidable fatality caused by illness, but it did leave a sense that every death was important, even if it did not merit mention in the columns of the local press. The idea that everyone mattered to someone was not such a bad thought for a child to have. Driving the Langport to Somerton road today, I stopped at the postbox opposite Upton. It was on a metal post and not in a brick pillar – but then it would be if the pillar had been destroyed in a crash fifty years ago.